Honor 9 Lite has launched about a month ago. The phone features a quad camera setup. It gives you the bokeh effect in a 13MP camera at low cost. It also features 3 GB RAM and Hisilicon Kirin 659 chipset. The phone also features an 18:9 full view display and runs android Oreo out of the box. So, at just 10,999₹ the Honor 9 Lite is a nice phone with four cameras, full view display, and latest Android OS. In this post, we will list most of the Honor 9 Lite tips, tricks, and hidden secrets. So check these out below. 1. Take Screenshots: There are four ways of taking screenshots on Honor 9 Lite. The first way lets you capture screenshots by a tapping a dedicated ‘Screenshot’ button in the notification panel. Swipe the notifications panel down and tap the ‘Screenshot’ button to capture a screenshot. Secondly, you can just press the ‘power’ and ‘volume down’ button at the same time to capture a screenshot. In a third way, you can use a three finger swipe over the screen to capture a screenshot. First, you have to enable the option in the Settings. Go to ‘Settings>Smart assistance>Motion control>Three-finger screenshot’. Here enable this option to capture screenshots by swiping three fingers over the screen. Lastly you can also take a scrolling screenshot (scrollshot). This is useful if you are reading a web page and want to capture a longer section of the web page. To capture a scrollshot first capture the screenshot by any of the means mentioned above. Now a screenshot popup will appear on the screen. Tap ‘Scrollshot’, phone will automatically start taking a scroll shot. Tap the screen whenever you want to stop capturing the scrolling screenshot. The scrolling screenshots are only meant for web pages. To capture the entire web page with all of its content you may have to take 2 or 3 scrollshots. 2. Use Split Screen View On Honor 9 Lite: Honor 9 Lite boasts a 5.65 inches touchscreen with an 18:9 full view display. So it's a large screen and you can split it easily between two apps. You can either open two Google chrome tabs and read the web pages simultaneously. Or you can open any other apps that support the split view. To open the split screen view on Honor 9 Lite first open an app of your choice then long tap and hold the ‘overview’ button for a while. When the split view gets enabled you can open the second app in the space given below. Tap and drag the blue button in the middle of the screen up or down to resize the split screen view of the apps. 3. Change Screen Resolution On Honor 9 Lite: Full HD screens have more power requirements then HD screens. So phone’s having HD screens are more battery efficient than phones having Full HD displays. But in Honor 9 Lite you can lower the screen resolution from Full HD+ to HD+. This will increase the battery capacity at the cost of screen clarity. To change the screen resolution go to ‘Settings>Display>Screen resolution’. Under ‘CUSTOM’ select HD+ (1440 x 720 (low)) to lower the screen resolution. Select FHD+ (2160 x 1080 (high)) if you want to set the resolution to full HD. Enable ‘Smart resolution’ if you want to let the phone automatically select the best resolution to save the battery. When the battery gets low the resolution will be auto set to HD+ if ‘Smart resolution’ is enabled. 4. Enable Power/Ultra Power Saving Mode: Huawei Honor 9 Lite comes with two modes when it comes to battery saving. One is the normal ‘Power saving’ mode and another is the ‘Ultra power saving’ mode. The ultra power saving mode is capable of saving more battery juice by turning the screen black and running only necessary apps like phone call app, messaging app, SOS app, and any two apps of your choice. To enable the power saving mode go to ‘Settings>Battery’. Here you can enable both the settings. If you are using ultra power saving mode then you can only use necessary apps. 5. Show Battery Percentage In Honor 9 Lite: To show the battery percentage next to the battery icon go to ‘Settings>Battery’. Here tap ‘Battery percentage’ and select ‘Next to icon’. You can also select ‘In icon’ if you want to show battery percentage inside the battery icon. You should enable this feature as it will always keep you updated about how much battery is left. Keeping an eye on the battery percentage will also let you know when it is the right time to enable the power saving or ultra power saving mode. 6. Change Screen Colour Temperature: Honor 9 Lite gives you an option to change the screen’s color temperature. You can set the color to warm or a cool range temperature to suit your viewing experience. To change the screen color temperature go to ‘Settings>Display’. Here tap ‘Colour temperature’. You will see three options ‘default’, ‘warm’, and ‘cool’. Select any option and tap OK. For custom screen color just touch the colored circle and drag the plus sign anywhere to select your desired color. Finally tap OK.
7. Enable Eye Comfort In Honor 9 Lite: As your smartphone screens emit blue light which is not good for our eyes in the dark. So to protect the eyes from the blue light you should enable the ‘Eye Comfort’ option. To enable it go to ‘Settings>Display’. Here tap ‘Eye comfort’ and again tap ‘Eye comfort’ to enable it. You can also schedule the eye comfort for start and end time. Use the slider under ‘Colour Temperature’ to increase or decrease the intensity of the eye comfort filter. You can set the filter’s intensity between the warmer and cooler color temperature range. You can also enable this from the notifications panel. 8. Change Home Screen Style In Honor 9 Lite: Honor 9 Lite has two types of home screen styles. One is the standard one in which the app drawer is not available. The seconds one is the ‘Drawer’ which enables the app drawer with home screen button in Honor 9 Lite. To change the home screen style go to ‘Settings>Display>Home screen style’. Choose the style which you want to apply. 9. Change Text Size and Style: A larger text on the screen is easy to read. Also, it puts less stress on our eyes because eyes will have to make fewer efforts in focussing the large text. To change the text size in Honor 9 Lite go to ‘Settings>Display’. Scroll down and tap ‘Text size’ then adjust the size by swiping the text size slider either left or right. Go back and tap ‘Text style’ to change the text font style. 10. Use Storage Cleaner on Honor 9 Lite: Honor 9 Lite comes with a built-in storage cleaner. The storage manager will let you remove junk files from your phone. You can always free up space by using the storage manager. Open ‘Phone Manager’ app and tap ‘Cleanup’. Use the ‘Deep Clean’ functions to find even more junk files and unused app. 11. Encrypt Your Files on Honor 9 Lite: With ‘File Safe’ you can encrypt your photos, videos, audio, and other files and lock them with a password. Files once added to this safe will be hidden from their original location and can only be seen in the ‘File Safe’. To create a safe go to ‘Settings>Security & privacy’. Here tap ‘File safe’. Tap ‘Enable’ to start the setup. You will have to provide a password and two security questions. After creating a file safe you just have to add files into it. Just add files and encrypt them so no one can access them except you. When required you can delete the safe from its settings and permanently delete files in it. However, before deleting the safe you can export your files to your desired location. 12. Use App Lock on Honor 9 Lite: Honor 9 Lite has a built-in app lock which is a system level app. You can lock your android apps without downloading any third-party app lock. To start using app lock go to ‘Settings>Security & privacy>App lock’. You will be asked to set a password and a recovery question during initial setup. After setting up the app lock you can lock your sensitive android apps like WhatsApp, messaging app or any other app. 13. Use One-Handed Mode on Honor 9 Lite: If you find the screen of Honor 9 Lite then you can use it in one-handed mode. To enable one-handed UI just go to ‘Settings>Smart assistance>One-handed UI’. Here enable ‘Mini screen view’. Now to enter the one-handed UI just make a swipe at the navigation buttons either from left or right. To exit, tap the black area and return to full-screen view. 14. Double Tap to Wake Screen: This is a very nice feature and is also available on Xiaomi phones. With this feature, you can wake the phone’s screen with a double tap without having to press the power button. To enable double tap to wake screen on Honor 9 Lite go to ‘Settings>Smart assistance>Motion control>Screen off gestures’. Here tap ‘Double touch’ and enable ‘Double touch to turn the screen on or off’. 15. Three Finger Screenshot on Honor 9 Lite: We have discussed this trick in our first tip. Scroll above to check it at the beginning of this article. 16. Change, Hide, Show Navigation Buttons: In Honor 9 Lite you can change, hide, or show navigation buttons. To change, hide, or show navigation buttons go to ‘Settings>Smart assistance>System navigation>Navigation bar’. Tap ‘Settings’ and select the combination on navigation buttons to change the buttons order. Enable ‘Navigation bar’ to enable the hide/show button. To hide the navigation bar just tap the tiny arrow on the left in the navigation bar. This will completely remove the navigation bar from the screen. To bring it back just swipe up the screen from its bottom where the Honor logo is located. In the navigation bar, you may see a fifth button and arrow with two parallel bars above it. This button is for opening the notification panel. 17. Enable Simple Mode In Honor 9 Lite: Simple Mode provides an easy way to use the phone. It provides large icons on the screen which are easy to see. You can also add your favorite apps. To enable simple mode in Honor 9 Lite go to ‘Settings>System>Simple mode’. Tap ‘Apply’ to start using it. To add your favorite apps in the simple mode just long tap any app tile and swipe to left two times unless you see multiple ‘Add’ option. Tap ‘Add’ and select the apps which you want to add in the simple mode. To exit simple mode go to ‘Settings>System>Simple mode’. Tap ‘Exit’ button. 18. Use Hidden Bar/QR Code Scanner: Honor 9 Lite has a hidden QR and barcode scanner. But it is not available as an app. To access this QR scanner just make a swipe on the screen in a downward direction. It will open a search box. Tap the QR scanner button in the search bar. 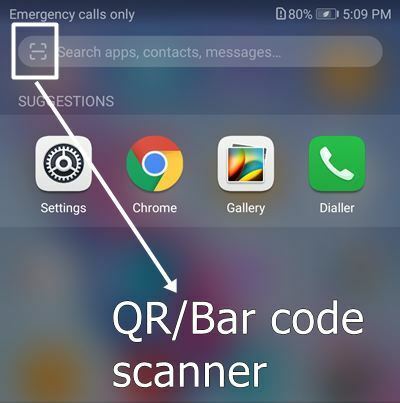 You can also scan QR or barcodes in an image and can enable flashlight while scanning a QR or bar code in the dark. 19. Force Restart Honor 9 Lite: Sometimes it may happen when your phone may hang or freeze completely. A restart is required to fix a frozen android smartphone. To force restart your Honor 9 Lite press and the power button for more than 10 seconds. 20. Enter Recovery Mode In Honor 9 Lite: In recovery mode, you can hard reset Honor 9 Lite. Hard reset will wipe the entire data stored on the phone’s storage. To enter recovery mode watch this video. Also, read about factory reset protection. 21. How to Change Themes: You can download and apply themes in your Honor 9 Lite. Simply go to the ‘Themes’ in the phone’s app list. 22. Use Sound Recorder: Stock Android smartphones don’t provide basic apps like a sound recorder. We have to download such apps from the Google Play Store. But Honor 9 Lite has a built-in sound recorder app. Go to ‘Tools>Sound Recorder’ to access this app. 23. Use Torch: To enable torch on your Honor 9 Lite go to the ‘Tools’ folder or hit the torch icon in the notification panel to turn it on. 24. Use Phone Manager: Honor 9 Lite has a phone manager that provides functions like cleaning the cache, managing the battery, system junk files, defragmenting your phone’s internal storage, and providing virus scan using the Avast cloud security engine. You can optimize your Honor 9 Lite with this phone manager app by just a single tap of a button. Open the app and see what performance improvements are being shown to you. 25. Convert Images to PDF: To convert images to PDF in your Honor 9 Lite go to ‘Gallery’ and open your favorite photo. Tap ‘More’ and select ‘Print or export to PDF’. On the top tap ‘Select printer’ and select ‘Save as PDF’. Just below the ‘Paper size’ tap the blue half arrow icon and set up the page settings. Finally, tap the ‘Save’ button which looks like a floppy. By default, all your PDF converted images will be saved to the ‘Downloads’ folder. 26. Enable Object Tracking in Video Camera: If you are shooting a video and just want to track a single object then enabling the object tracking will give you good video recording results. Simply open the camera app and switch to a video camera. Now swipe left on the camera screen and enable ‘Object tracking’. This feature works only with the rear camera. 27. Change Screen Transitions: To change screen transitions on your Honor 9 Lite first of all go to the home screen. Here long tap on the empty space where no icon or widget is located. Tap ‘Transitions’ and select your favorite transitions for the home and app screen. 28. Access App Shortcuts: You can access app shortcuts for any android app installed on your phone. For example, if I want to open a new tab in the chrome browser then I will long tap its icon in the app or home screen and select ‘New tab’. Similarly long tapping the ‘Settings’ button will give you four network connectivity options. The good thing is you can even put a shortcut of these app shortcuts on the home screen. Simply long-tap an app to open the shortcuts, then long tap any shortcut to make its shortcut on the home screen. 29. Use App Twin: With app twin, you can install two same android apps on your Honor 9 Lite. You can have two WhatsApp accounts with different numbers on your Honor 9 Lite or you can have two Facebook apps installed, or two Snapchat apps installed on the same phone. You can also install two Instagram apps on this phone. Simply go to ‘Settings>Apps & notifications>App twin’. Here you will see a list of the apps which can have a twin. Simply enable the app twin to install its second instance. 30. Enable Screen Recording: Honor 9 Lite has a built-in screen recording function. This is a very nice feature as you don’t have to install third party recording apps. But there is a problem with this built-in screen recorder as it is not even customizable. You cannot change its resolution or apply a watermark. Before using the screen recorder you first have to enable it. Go to the notifications panel by swiping down the top of the screen. Here the ‘Pencil/Pen’ icon for editing the icons layout. You will see many icon tiles here. Drag and place the ‘Screen recording’ tile to the main notification icons list. Now go back and tap the ‘Screen recording’ button to start recording your phone’s screen. Use the built-in ‘File Manager’ to locate these videos. The videos are located in ‘Internal storage>Pictures>Screenshots’. Check the date and time stamp of the videos to find your latest recorded video. 31. Enable Ride Mode On Honor 9 Lite: With a new OTA update (LLD-AL10 8.0.0.142(C675)) the Honor 9 Lite has received a new built-in feature known as ride mode. Whenever you want to ride your two-wheeler vehicle then you can enable ride mode on your phone. This will let the calling person know that you are currently riding a bike and cannot take a call. To setup go to ‘Settings>System>Ride mode’. Before enabling it configure it like ‘Preferred answering method’, ‘Auto answer by voice’, ‘Ride tracking’ and analytics. After configuring enable ‘Ride mode’. So these were some of the tips and tricks for the Huawei Honor 9 Lite. If you liked the article then please share it.